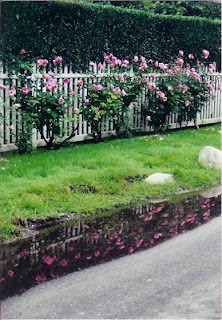 Simplicity at the above photo was in front of white fence at a friend’s home in Huntington, NY with reflection of roses in puddle on the road. Simplicity is a semi-double medium pink floribunda with 18 to 24 petals hybridized by Bill Warriner and introduced by Jackson & Perkins in 1978. 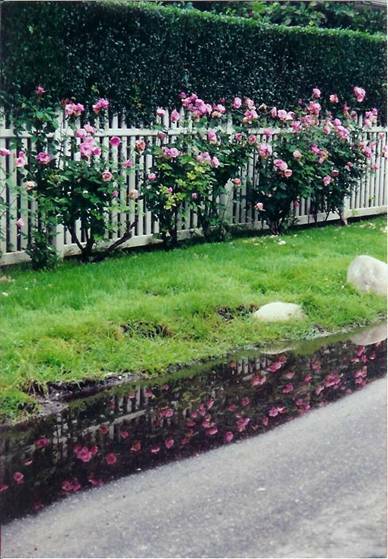 It is an excellent landscape or hedge rose. 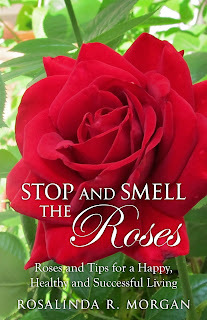 Rosarians love them because they are very healthy and generous on blooms. However, there is very light or no fragrance at all. It is a tall, vigorous, disease-resistant and winter hardy plant with medium green, semi-glossy foliage. It blooms well in all climates. Originally Jackson & Perkins sold them in lots of ten as a “living fence”. Since its patent has expired, it is now available individually at other nurseries. Besides Pink Simplicity, there are now Yellow Simplicity, White Simplicity, and Fragrant Lavender Simplicity. They are all excellent plants for hedges.